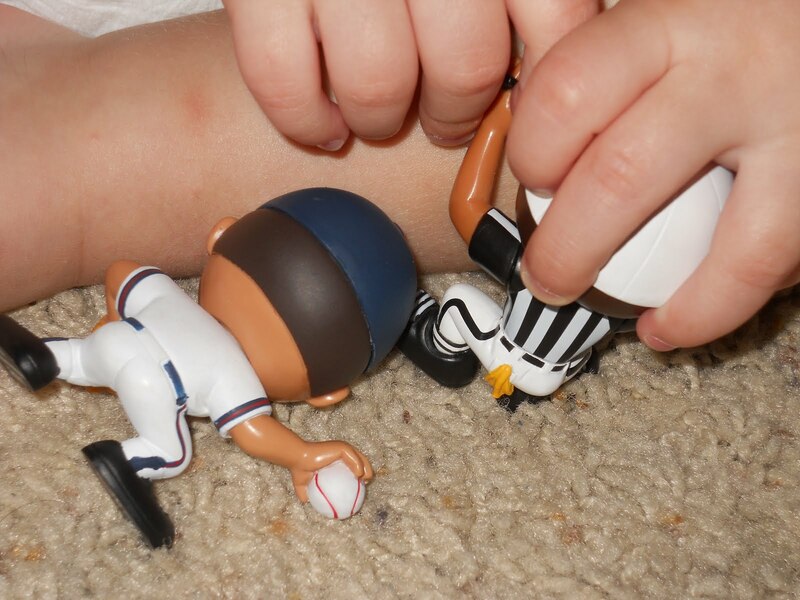 Have you heard of the Lil' Teammates that are slowly entering the homes of sports lovers everywhere? 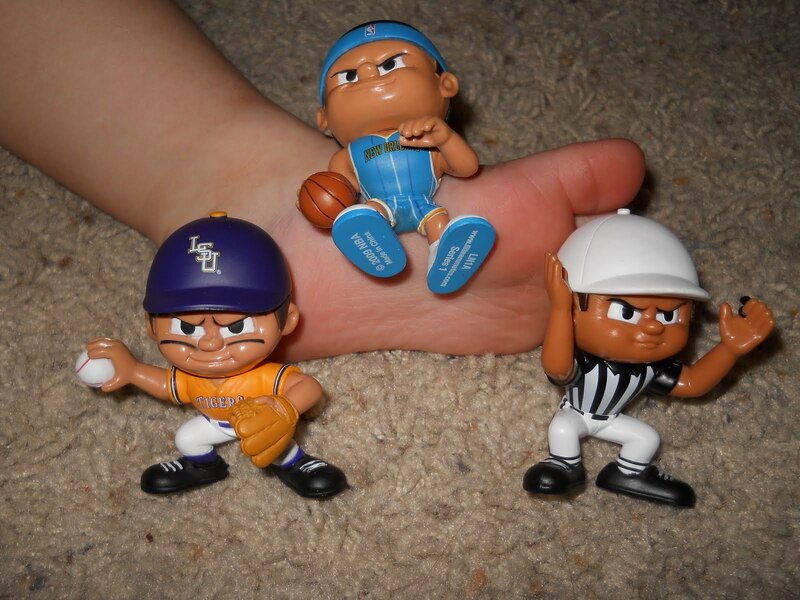 · 3" tall collectible action figures for little sports fans, ages 4 and up.
. Officially licensed for NFL, MLB, NBA, NHL, and over 50 colleges. · Over 120 figures altogether for SERIES 1 alone. · Durable. MADE FOR PLAY! · “Big kids” love ‘em too! Great collectibles. · SERIES 2 coming this summer. More positions. More articulation. · Corresponding interactive website allows kids to register their figures, play games, learn about their favorite teams and win free stuff! But enough of that ..
Well, we gave Broxton one of them and that was all he was going to get ... In the beginning. They were just so cute that we had to get them all out to play! We got the rest of them out and let him have at it. He calls them "the men." If he can not find them, he asks me where the men are and then we go looking. He played and played... and then had to hide them! Luckily, I knew where they were, because when we were leaving, I had to go and get them..
Talk about a big upset if we would have left them!!! He plays with them together and individually and so far, it has stood up to the test of all he has put them through! I love how they have such a wide variety of teams and sports!!! They are also adding more! I told Marc that this is a great thing that we will have to get for Christmas this year!!! Talk about a great gift!!! Oh... Fathers Day isn't to far off!!! Why not go ahead and start planning now?! You know it really is never to early to start! Lil' Teammates is giving 3 lucky winners a chance to win!!!! 2 Figures of your choice. 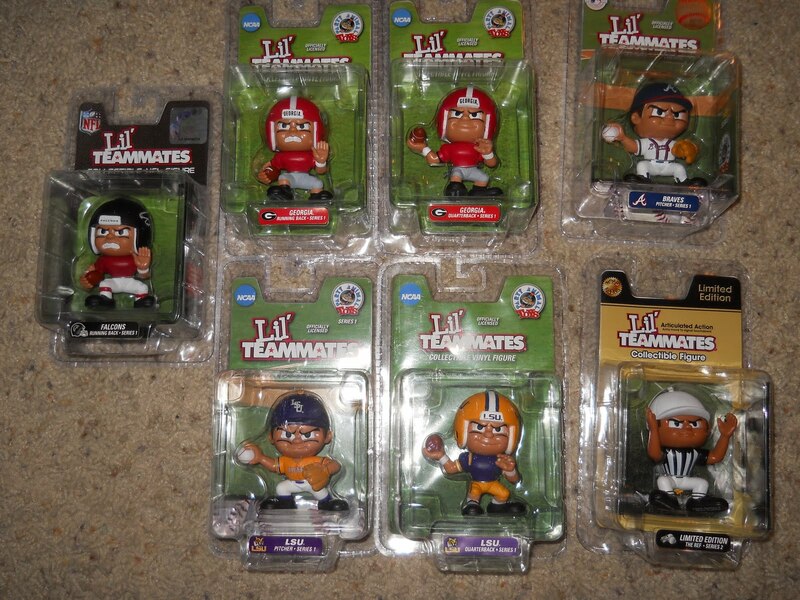 Head over to Lil' Teammates and leave me the LINK to the ones you would pick if you win. Contest will end May28 at midnight. Contest for US residents, 18 and older. Random.org will select the winner. Winner will have 72 hours to respond to winning email or a new winner will be selected. Hey those look neat! I may just have to buy a couple for when critter comes to visit! 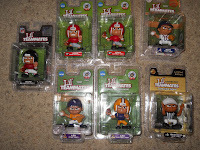 I would pick http://www.lilteammatesshop.com/p-146-florida-gators-quarterback.aspx and http://www.lilteammatesshop.com/p-100-florida-state-seminoles-quarterback.aspx. I Like Lil' Teammates on facebook - liz t. n.
I Like you on facebook - liz t. n.
I follow you on Networked Blogs - liz t. n.
I would love this one. I would also like this one. I follow Lil teammates on twitter, nikkidavis05.